Customers judge books by their covers. I don't blame them. If the cover art looks unprofessional, I would assume the writing is unprofessional as well. So why should you select me to design your cover? I've been designing covers for seven years now for over 100 clients across every genre. To this day, I've never had one unsatisfied customer. How do you know I'm any good? The proof is in the portfolio. Take a look. I think the covers I've done for a wide range of authors speak for themselves. My process is to treat you like a paying client, because that's what you are. I will give you 5-10 initial layout options and then refine from there. Then I will spend a couple rounds of design giving you about 10 options for title fonts and fonts for your name. The result will be a cover that will be exactly what you want. I believe every author should be proud of their entire book, including the cover. Once the ebook cover is complete, I charge $100 to design a full print paperback cover. Clients often come to me a few months later for this. I'm happy to discuss any questions you might have before you pay anything. This page will get you started. I thought it would be helpful to prospective clients to visually see the process for how I work. 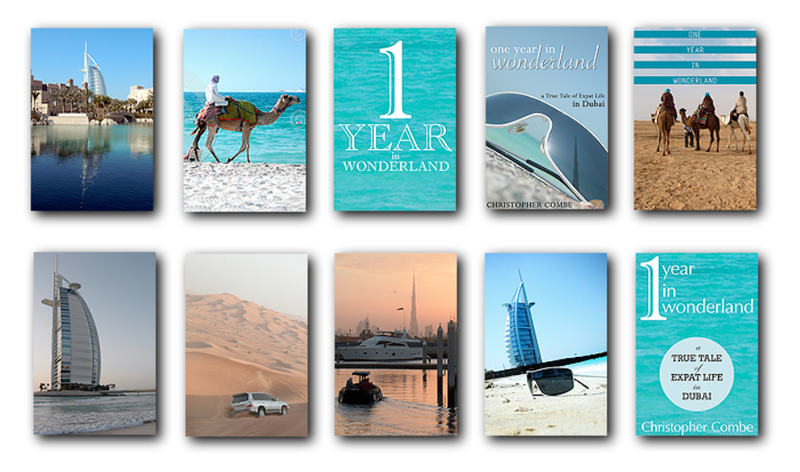 This example is a book by Christopher Combe,One Year in Wonderland: A True Tale of Expat Life in Dubai. As he put it the book is "an account of one British family’s year in Dubai, based on a blog written between 2006 and 2007. It uncovers the story of the real Dubai and highlights the challenges of adaptation to a new culture." So I wanted to give him a cover that represented living in Dubai from an outsider's perspective and also appeal to a mass audience. The first round is always the widest exploration visually. At this point text is merely a placeholder. As you can see, some of them I didn't even place any text, although now I've gotten to the point where I usually place text in all first round options. I try and give clients a range of styles: photographic, text as graphic, composite elements, etc. The second round is where I refine the background. Often that involves a color exploration or slight modifications such as erasing birds or smoothing grass, etc. In this example, Chris still wasn't sure which background to pick. So I explored a few options. He liked the color bar treatments from round one, as well as sand and water backgrounds. He also wanted to see how the sunglasses option from round one would look with a different Dubai building reflected in the glasses. I was happy with how I was able to treat the building to truly look like a reflection. At this point he selected the sunglasses background. Fonts are probably the biggest thing that separates a professional cover from a not-so-professional one. I like to give clients plenty of choices. I start with just the title font and everything else stripped away. The title is the most important and impacts further font choices. And I think it's easier to focus on one thing at a time. Sometimes round 4 is the author's name. In this case, he had both a subtitle and a callout for Updated & Extended Edition that he wanted added. The final step is the author's name. I have some repeat clients and some of them prefer to keep this consistent across all their books, to build their brand. There you have it. Lots of options means you get exactly the cover you want. Go here to ask questions or hire me.